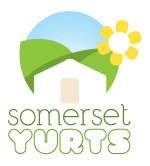 Happy Somerset Day from all of us at Somerset Yurts! We love living in this beautiful county, and sharing a little slice of it with you when you stay with us. To celebrate, why not have a look at this recently published guide to Secret Somerset? Pictured here is Will exploring one of our favourite places in the list at Fyne Court. Many of these secret places are within easy reach of the yurts, and there are a fair few new ones on my list to discover – such as the Willow Cathedral in Taunton, and the volcano walk at Great Wood!